You turn the bright bluish stone through your fingers. It seems to glow like a neon sign. Where did it come from? You’re holding a genuine neon apatite stone! Often confused for other jewels, learn how to identify neon apatite and tell it apart from other varieties of apatite. What is Malgache Neon Apatite Stone? How rare is neon apatite is as a gemstone? 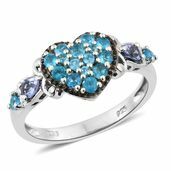 Despite its stunning appearance, apatite is still rarely seen in gemstone jewelry. It’s tough to work with, meaning that for many years most specimens were collector’s stones. Our gem-cutters have been working this material since the early days of the Madagascar apatite boom. During this time, they’ve perfected shaping this troublesome mineral into many popular shapes. Gem collectors and jewelry connoisseurs alike will delight in adding Malgache neon apatite to their collections. Despite not being well-known, apatite is the defining mineral on the Mohs scale of hardness for rank five. It’s a stone that requires care to shape and care to enjoy! Is neon apatite valuable? The value of colored stones is typically determined by a combination of its color, clarity, cut, and carat weight. This is no different when determining what neon apatite is worth. These guidelines will help you choose Malgache neon apatite stones for your collection. Apatite occurs in a wide range of colors, leading to the stone’s reputation for confusion. Malgache neon apatite favors an intense neon blue-green to blue color. The intense saturation of color creates a striking stone, crackling with electric energy. When choosing neon apatite, the stone’s color is most important. 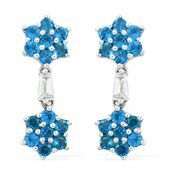 Apatite favors a deep saturation of color, creating very vivid stones. Malgache neon apatite is highly sought after for its bright blue colors, a color often underrepresented in blue gemstone jewelry. You can expect to see inclusions in neon apatite. As a Type II stone, it’s expected to contain inclusions. Eye-clean stones are rare and more valuable. Deeply saturated color often masks these characteristics, making them difficult to spot without the aid of a loupe or other source of magnification. After polishing, neon apatite takes on an appealing vitreous luster and glossy shine. Apatite is known to be fragile, and many cutters shy away from the stone due to its brittle reputation. Skilled lapidaries, however, can shape the stone. Since the Madagascar apatite boom, Shop LC gem cutters have been honing their craft with this stone. Expect to find Madagascar Apatite in the shapes you love, carefully hand-cut to perfection. The most popular shapes include round, pear, and oval. The round brilliant is a classic choice for gemstone jewelry, popular for it universal appeal. Oval and pear shapes are excellent choices for anyone who wants a larger looking gem. Both provide the appearance of a more substantial stone even when in a smaller size. Due to the delicate nature of neon apatite, only about eight-percent of rough material ever becomes a polished stone, adding to its rarity. Most Malgache neon apatite stones are under a half-carat in size. Due to the stone’s rarity, it is very unusual to find larger specimens. Treating gemstones is a widespread practice, and treatments improve the appearance of a gemstone. This means more stones can enter the market, providing affordable options that wouldn’t exist otherwise. Malgache neon apatite undergoes heat treatment to improve the color of the stone. It helps even out the tone throughout the jewel, creating an even and desirable color. Heat treatment is one of the most unobtrusive treatment methods, only detectable by trained professionals with specialized equipment. Who Can Wear Neon Apatite? With its bold and bright color, Malgache neon apatite can feel like an intimidating jewel to wear. However, this couldn’t be further from the truth! Neon apatite jewelry is something to be enjoyed by anyone who fancies the gem. Blue is one of the most universally popular colors, and there are many ways to utilize it in your daily style. Consider these options for wearing neon apatite. Wearing neon apatite works best in one of two ways. When using bright colors in clothing, neon apatite offers fun punctuation and spots of color to cheerful spring and summer palettes. A life-affirming color, it’s a fun choice for lively outdoor events. Contrasting this use is making your Malgache neon apatite jewelry the focal point of an outfit. By contrasting the gem against subdued neutrals, the apatite injects a dose of color that adds an element of energy to your style. How Does Neon Apatite Compare to Other Apatite Stones? Malgache neon apatite stands apart from other apatite stones due to its color. While gem-quality apatite is an intensely saturated material, neon apatite will always display a shocking burst of color. Paraiba apatite is the closest cousin of neon apatite, and both gems are well-known for their intense color. Paraiba apatite favors softer blues than neon apatite. Where Does Neon Apatite Come From? Shop LC sources Malgache neon apatite variety from the island country of Madagascar. 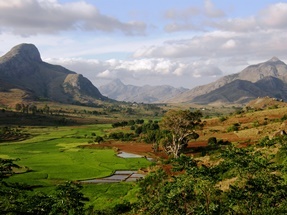 Situated off of Africa’s southeastern coast, Madagascar is an important supplier of raw mineral material. How is Neon Apatite Mined? A variety of methods are used in mining neon apatite. Large-scale mining operations use machinery for extracting the stone from large open pits. On the other side of things, artisanal miners employ hand tools when digging the stone from the ground. What Does Neon Apatite Mean? Many gem therapists view apatite as a stone that’s useful in connecting our past and future. In these circles, it’s believed apatite clarifies confusing situations, paving the way for enlightenment and self-expression. In particular, blue apatite is valued for its stimulation of the mind, enhancing intellectual pursuits. Others suggest that apatite is useful for strengthening bones and repairing damage to cartilage and joints. They purport that apatite gems aid the body in the absorption of calcium. Is Neon Apatite a Birthstone? Malgache neon apatite is not recognized as a modern birthstone. 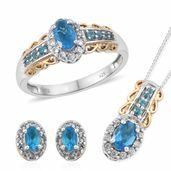 Its rarity in gemstone jewelry has kept neon apatite as a collector’s gemstone. Neon apatite ranks five on the Mohs hardness scale. Neon apatite possesses an intense blue-green to blue color. Shop LC sources our supply of neon apatite from Madagascar. Neon Apatite undergoes heat treatment to create and improve color. How to clean Neon Apatite.